Note: For each garland strand I decided to use 8 different color shades, using each shade 6 times – feel free to change these quantities for your garland. Since each heart takes up about 1″ (inclusive of spacing from the next heart), I knew each garland strand would be about 48″ (4′ long), which was going to be a perfect length for what I was going for. To get your desired length, make sure to calculate out the length first, like I just explained for mine. 1. Select your preferred paper colors in a range of shades of pink (or whichever color you prefer). For each garland strand, you’ll need 12 hearts of each color. 2. Arrange your colors in gradient order from light to dark. Look good? If the gradient looks good, continue on! 3. Starting at one end of the thread, tape it to your surface to ensure a straight line, and place your first 6 hearts (lightest color) under the thread. Apply glue to another 6 hearts of the same color and adhere on top of each heart, sandwiching the thread in between the 2 hearts. Working from light to dark, repeat with all of your colors, moving down the piece of thread. Note: As you can see, I used a measurement grid as my working surface, so that I could make sure all of my hearts were equally spaced. If you don’t have one, just use a flat surface and place a ruler alongside your thread. 4. Once you’ve glued on all of your hearts, cut the end of the thread after the last heart. Now, if you’re just making one garland, stop here and hang up that beauty! If you want to make a curtain (perhaps for a photo booth or backdrop), continue making garlands. Warning: this can be tedious (very tedious). I crafted my curtain over a few days, completing 3-4 garlands each day, in an effort to not get bored or spend too much time at once on it. Now, if you want more than one garland but don’t want to make a curtain, here’s a couple more ideas. Hang the garlands horizontally in a corner of a room. With proper lighting, the shadows of the hearts look awesome lit up in a corner. Or, hang from the ceiling, in a door, along a window, or just about anywhere. 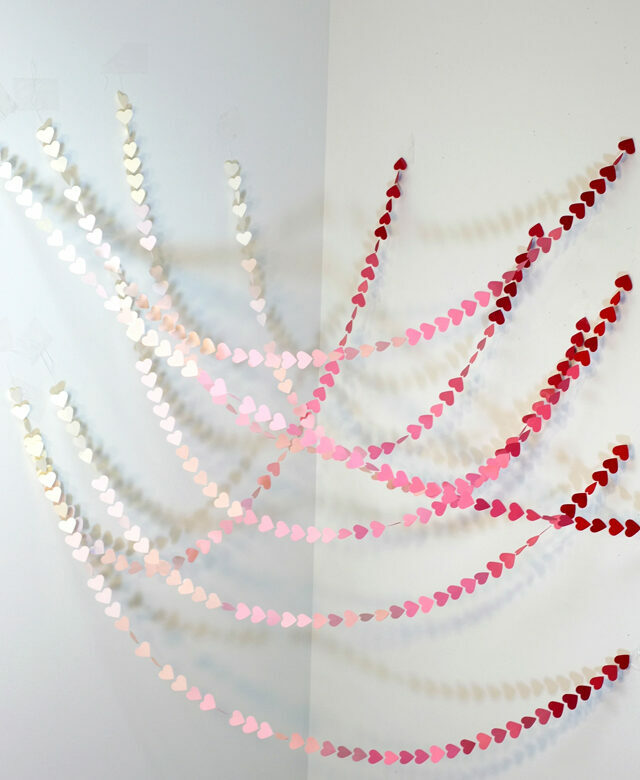 This ombré heart garland looks beautiful everywhere! These are super cute! I love ombre.